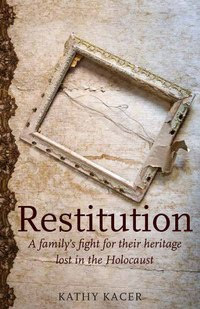 Restitution : A Family's Fight for Their Heritage Lost in the Holocaust is another title I picked up at the Book Expo, courtesy of Second Story Press. It was also one of the first I read upon my return, but unfortunately it wasn't immediately available in the U.S. However, I'm happy to say that you can now find a copy of Restitution here in the states and I'm pleased to make the introduction. Restitution tells the true story of the Reeser family's escape from the Nazis from their home country of Czechoslovakia. An influential Jewish family, Victor Rieser (the family changed their name after immigrating from their country) found it hard to believe that their family would be persecuted by the Nazi regime. He refused to believe that a loyal Czech citizen would be brutalized or mistreated by their own government. His children, Karl and Hana listened to the debates between their father and mother, Marie, as they argued over whether or not to move their family and finances outside of the country. Thankfully, Helen had the foresight (and stubborn will) to begin to move the family money to foreign accounts to ensure that her family would be provided for upon their eventual relocation. She was a smart and insightful woman and her efforts paid off for the family when they eventually did flee their home country. However, there were four things that the family had to leave behind: four works of art that hung on the walls of the family home. Restitution tells the story of the family's efforts to retrieve these family heirlooms in post-war Czechoslovakia. The book documents their journey and struggle, taking the reader between the 1940's and 1990. It is a moving story of courage and determination. Kacer writes in a compelling manner, easing the reader along and keeping them fascinated in the Reeser family's journey. I absolutely loved this book. I thought it was well-told and documents a different aspect of World War II - stolen art. (For another work on this topic, you might want to check out my review of The Monuments Men over at 5 Minutes for Books.) Of course, I love World War II history and so I eagerly engaged with the emotions of Karl Reeser as he sought to obtain what was stolen from him by a hateful regime. This book is a winner and one worth checking out. I am happy to let you know that Second Story Press has offered a giveaway copy to one Reading to Know reader! Would you like to win a copy? Simply leave a comment below to be entered into the drawing. This contest is open to U.S. and Canadian residents. The contest will remain open through Thursday, October 14th. This contest is now closed. The winner, selected by random.org, is #23 - Wanda. Congratulations! In the meantime, if you enjoy a good memoir or an interesting history lesson, check this one out. Thanks so much for this offer! I appreciate it. The book sounds great! This sounds like an interesting book. Please enter me. This sounds like a really interesting book, I would love to read it. Sounds like an interesting read! Would love to win! Thanks for the giveaway! This sounds like a very interesting book. Thank you for offering this giveaway. Sign me up for this one, too! This sounds like a fascinating book! Count me in :). I am fascinated with WWII history, and personal stories are so amazing. I would love to read this book, and I hope my library will obtain it if I don't win it here. I enjoy reading about the WWII era, to educate myself more. This book gives credit to the losses of the Holocaust. I would love to read Restitution :) *Thanks* for the giveaway! I would like to read Restitution.Please enter me in the giveaway. augustlily06(AT)aim(DOT)com.Thank you. Oooh, this sounds like a GREAT book. I would love to read it! while i hate to say i "enjoy" holocaust things...it just sounds wrong.....i do enjoy books about the holocaust. This is a very interesting subject. I do like to read personal stories about WWII and people who survived the camps. I am interested their journey to get restitution. I'd love to read this--thanks for the giveaway! These books fascinate me. I'd love to be entered. This sounds great. This looks like an incredible book. I would love to be entered in your draw. Thanks. This sounds like a fascinating book. I'd like to be entered please. Thanks for offering this giveaway. I love WWII history! Sounds like a fascinating book! I'm bummed I missed entering the giveaway! I'll have to see if my library carries it.